The paper whites — the ones we had forced indoors in jars around the holidays — were spent and blossomless, and still we let them sit there, leaves flopped over the jar rims, on the table and mantle. Outside, enough snow has melted that I see dirt everywhere. 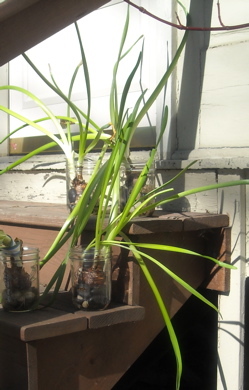 This morning I put the jars on the back steps that go from the old screened porch down into the yard. I went into the kitchen and put on my coat, slipped on my boots. In the garage, I found the small spade and pruners. Near the southeast corner of the house, where it warms early in the spring, I dug a mini trench, about six inches deep. Into the damp cold dirt I pressed the four bulbs, with their whiskery roots, some even holding on still to the pebbles from the jars. I covered the bulbs with dirt, and trimmed the green leaves to five or so inches. I thought about how February is not a good time to plant bulbs, even below the frost line. 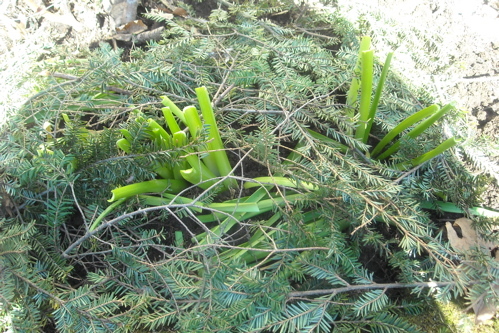 I found some downed hemlock branches and lay them like a blanket on top of the bulb patch. It’s possible that the bulbs will freeze and then rot. It’s just as possible that the six inches of packed dirt and the hemlock blanket will keep them viable. They may not sprout and bloom again in 2009, but maybe they’ll lay low and surprise me in 2010. By then, I may have even forgotten about them, so that when they do sprout, it’ll be like some kind of magic. A gift. As a gardener, one can certainly follow all the guidelines and rules of thumb and get what’s intended. For example, I have divided irises and hostas according to the gardening authorities, and the results have been gratifying: more irises, more hostas, in more places. One can also, as a gardener, make mistakes and even garden unwittingly, and still come up with something fine. 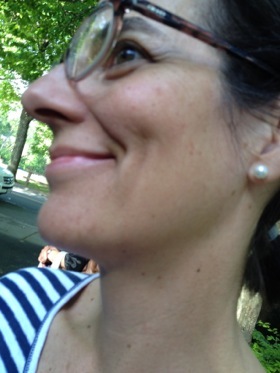 When I was about five years old at most, I sucked on a peach pit until all the fruity pulp was gone, and then, in the shaded dirt outside the kitchen door, not too far from our house’s foundation, I dug a hole using a kitchen spoon and dropped the peach pit in. Because I was a child, I did not tend that spot; I did not water it or check daily for a green sapling. And yet it grew — maybe my mother noticed it — and grew and grew and eventually became a tree with peaches that we ate. They were never beautiful peaches, and we ate them peeled and stewed, but they were peaches, and it was a tree. I garden both ways: I follow the directions sometimes, and other times I defy them, or at least I bend them. This is what I believe: things that grow want to grow. (Or, sometimes they don’t.) I must do what I do, and then wait and see what they do. The Peach Tree – we emphasized the “The” and not “Peach” – can’t you hear it?